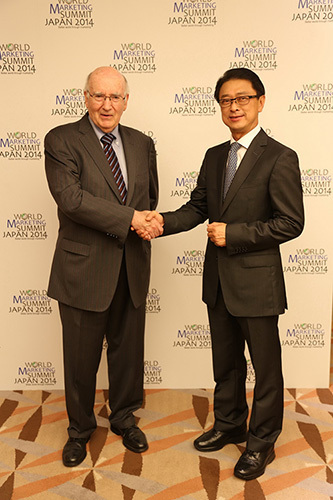 Tokyo, Japan, 4 October 2014 – High quality paper maker Double A shared the innovative strategies that elevated Double A to a global premium copy paper brand at the recently concluded 3rd World Marketing Summit in Tokyo, Japan. “Paper is my life and it has always been my goal to produce the best quality paper that is good for the world”, said Mr. Yothin Dumnernchanvanit, President of Double A.
Mr. Yothin shared to the audience the “Double A Way” of creating branded paper in the session ‘Innovation through Marketing’. “Double A Way” is comprised of three pillars of Sustainable wood source, Social harmony for communities and Self-sufficient “no waste is wasted” production cycle. Key innovation to Double A’s success, Double A Paper-Tree, is the company’s branded, fast growing paper tree that yields high fiber content for quality paper making. High fiber count gives better bulk, higher opacity and smoother surface for “No Jam” copying. This consumer benefit has been supported by integrated marketing communication campaigns in key countries such as Singapore, China, South Korea, Australia, and France. Double A has achieved high brand awareness and preference among consumers throughout the world. In Thailand, Double A has complimented the country’s agriculture industry by growing paper trees along KHAN-NA, the otherwise empty space between rice paddies. This empty space has now turned into an income-generating area that supplements income of rice farmers by up to 10%. “As we work with farmers, we create social harmony with the communities. Farmers earn additional income from growing our trees and this helps them pay off their debts and keep their children in schools, so they can grow up with more choices”, added Mr. Yothin. Double A’s integrated mill in Thailand is self-sustaining. It produces its own renewable electricity from its waste materials, sources all water from its own rainwater reservoir, and sustainable fiber from its paper trees. “All of these pillars are summed up in “My Green Town”, a community situated in Prachinburi that was once one of the poorest provinces in Eastern Thailand. We have developed this area for 20 years, and it has now become a thriving community of 100,000 residents with an average household monthly income of THB 21,000 or 300% more than in 1994. We were cited by Prof. Philip Kotler as an example of a good company that does good. If you would like to be part of “My Green Town”, I invite investors to visit us in Thailand and experience our sustainable infrastructures at 304 Industrial Park, which is now home to more than 100 global companies such as Toshiba Semiconductor (Thailand) Co., Ltd and Canon Prachinburi (Thailand) Ltd, and over 40,000 employees.”, said Mr. Yothin.